I think I just found the best tasting cookies in the whole wide world! I cannot pick just one, I love them all. 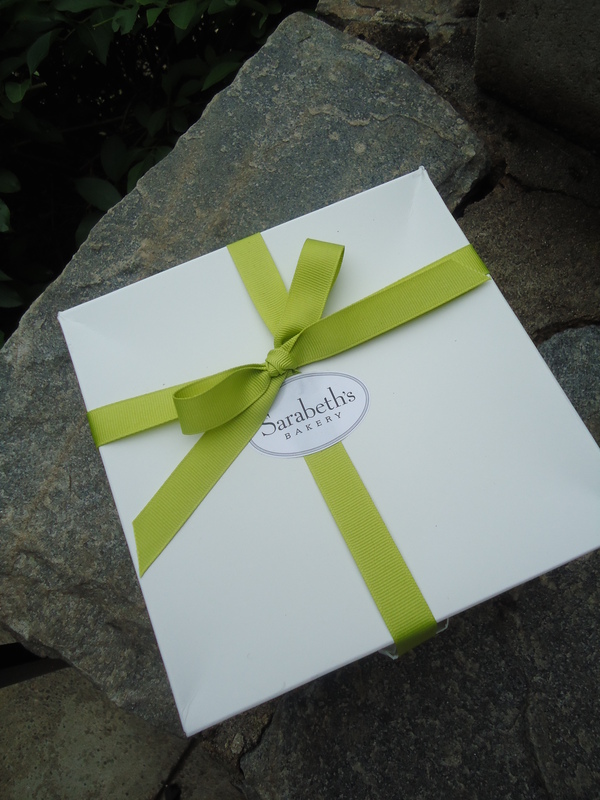 They are cookies from Sarabeth’s Kitchen, located in The Bronx, NY. And yes, there really is a Sarabeth. 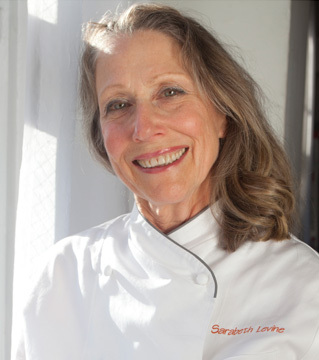 Sarabeth Levine, an award-winning jam maker, acclaimed pastry chef and restaurateur, who is the driving force behind the success and outstanding reputation of the Sarabeth brand. Sarabeth’s personal search for perfection extends to everything she creates. In 1981, Sarabeth began making Orange-Apricot Marmalade from her home kitchen from a 200 year old family recipe and selling it to local food shops. From that humble beginning, Sarabeth with her husband and business partner, Bill Levine, now own and operate a jam factory, a wholesale-retail bakery café and nine restaurants. It is a true American success story. But back to the cookies! 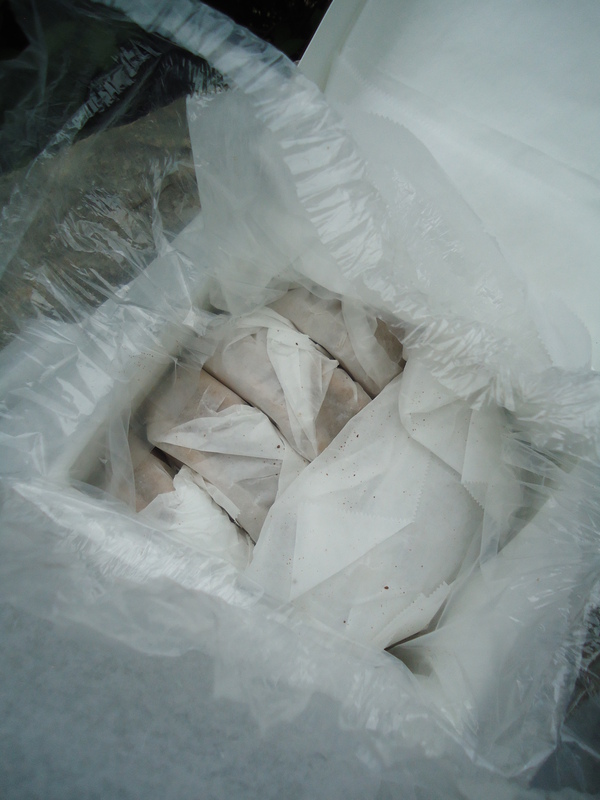 The come perfectly wrapped and freshly baked. I could actually smell them through the box when the FedEx Delievery Person dropped them off. I could not wait to open the box! 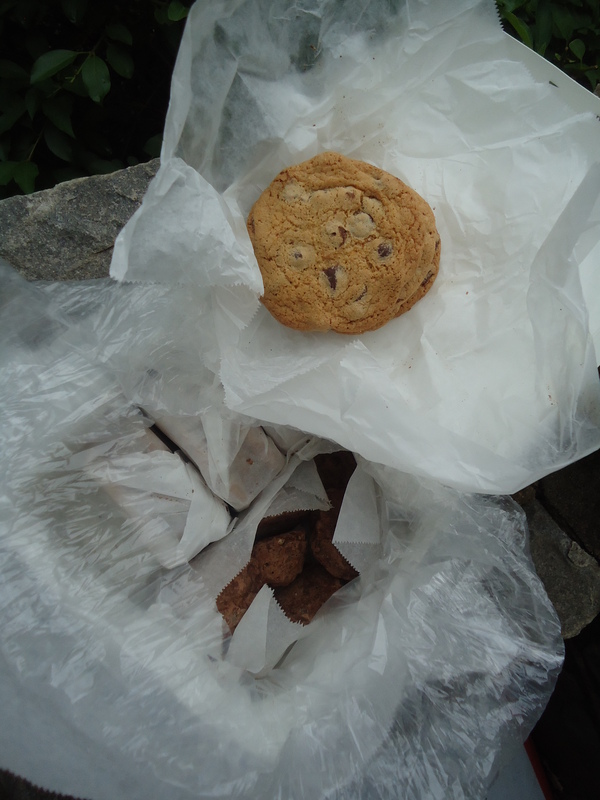 I ordered the Mixed Cookie Box…….And look at what was inside. Sarabeth’s quest is to provide every customer with an experience that reflects her devotion and passion to creating wholesome food. The mission of Sarabeth’s is to offer simplicity, perfection and classic tastes in her restaurants and through her products. And yes, these cookies do deliver. With a richness and homemade perfection that you thought your mother or grandmother could bake with so much love. These cookies are worth every penny, trust me! Just so you know in advance…….. These cookies are baked on demand. 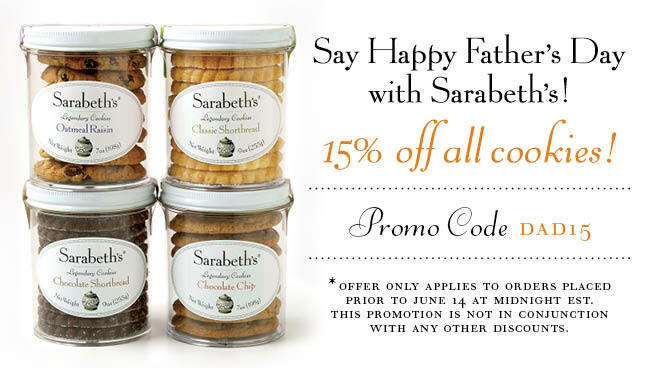 And just in time for Father’s Day, Sarabeth’s is offering 15% off of all cookies! Use the code “DAD15”. Not just a gift for Father’s and Dad’s on their special day, but you can also treat yourself to a box of cookies too! 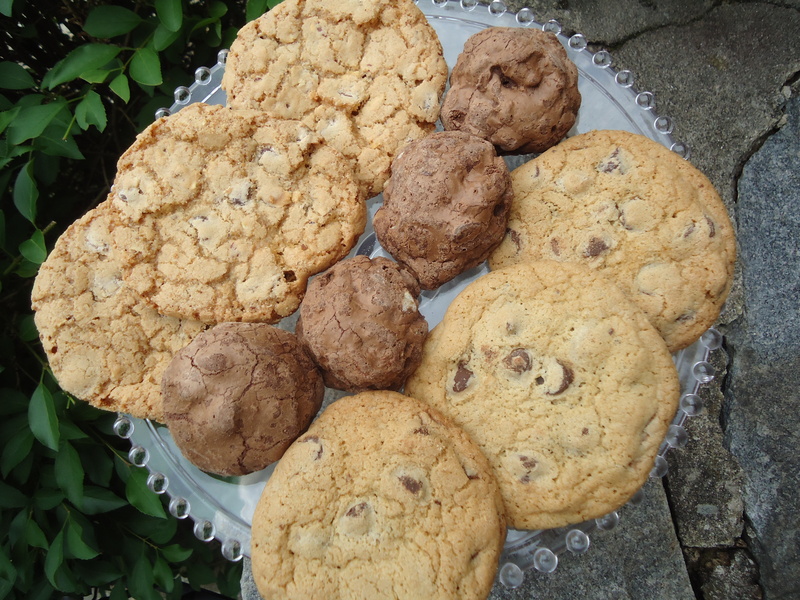 Here are just a few of the cookies that are offered from the bakery at Sarabeth’s Kitchen. 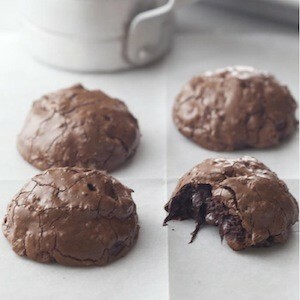 Just click on the name of the cookie and you will be directed to the site! It’s not a brownie. It’s not a cookie. It’s a Chubbie. Three types of chocolate and two types of nuts (walnuts and pecans). These are chocolate nut heaven. These delectable cookies are the favorites of Sarabeth’s cookie craving multitudes. 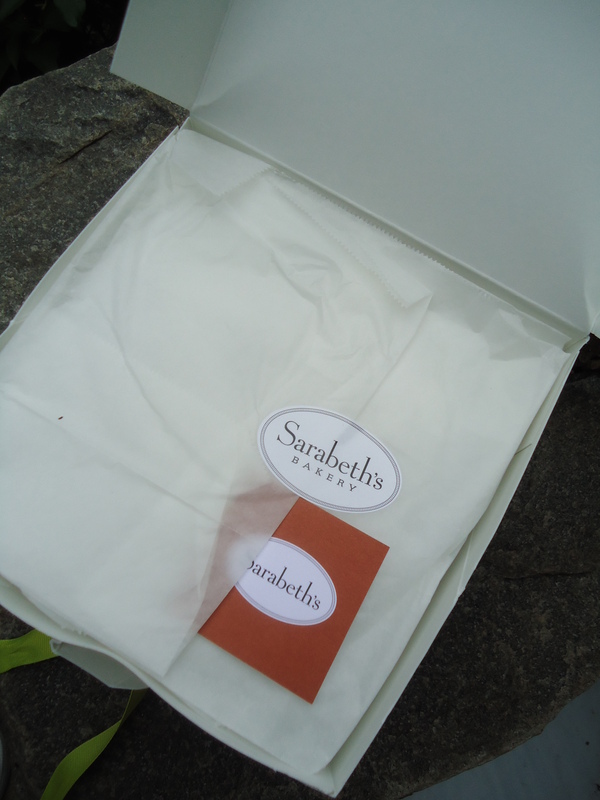 Baked fresh daily to order, they come packaged in a white bakery box, festooned with a bright ribbon and Sarabeth logo sticker. You cannot go wrong bringing this gift to a friend, unless you eat them all before it gets there. You get 6 Chocolate Chip Cookies, 8 Chocolate Chubbies and 6 Chocolate Chip Clouds. 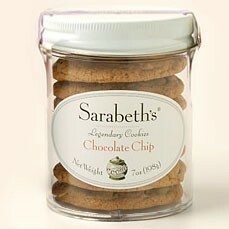 Sarabeth’s hand-made, all-natural, selection of 4 popular cookies come packaged in a reusable food-grade plastic jar. Chocolate Chip, Classic Shortbread, Chocolate Shortbread and Oatmeal Raisin. Use the empty jars for storage of cereal, sugar, candy, leftovers, nuts (and even bolts!) or other assorted hardware! Baked to order.